Always compared to Avington, Dever became legendary in the early 90s with massive rainbows and Browns being caught regularly. Hit the headlines for all the wrong reasons when the 36lb leviathan record was withdrawn when the captor admitted to cheating. The lakes arent as picturesque as nearby Avington but are still pretty enough with lush weed growth in the summer. The venue seems to be moving away from 'the ultimate big fish water' to 'the UKs finest fly fishing' and while in the 90s the former was definitely true, today it's arguable about the latter. The fish are typically very good and fight well. There are always some huge fish about, but for me, somehow the magic has gone a bit. Dever now seems like a premier stillwater rather than a place where every glance into the water could turn your hair grey! PBs from Dever Rainbow 16lb 4oz Brown approx 8lb. Nice report. I reckon I got my grey hair from this venue. I see that you have mentioned that they are charging extra for River Dever stretch. Can you tell us what that might be? Don't quote me on this because i didnt pay it, but i fished dever last year and fancied a go on the bottom part of the river where i'd seen some nice browns. I enquired at the hut and was told it would cost �40 to fish the river..! I think it's booked separately from the lakes and has a max of one or two rods. IMO it's not really worth it, there's only a few spots that could hold a nice fish, apart from loads of small grayling. I will be down at Dever tomorrow. Four hours drive from me, but can't wait to fish the place. Hope you have a good day fishing there! I did when I went. Be careful though, fishing blind (i.e. 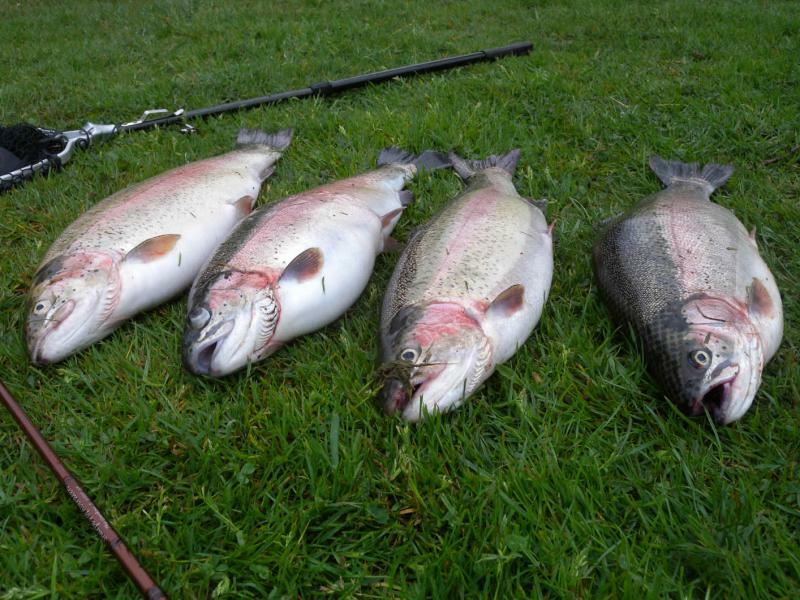 casting out without seeing the fish) can fill your day ticket up very quickly. Try, if light conditions allow, to stalk your fish. The small lake as you drive in is normally very clear and you can see the fish. The big lake by the lodge can be more difficult however, the corner swim by the driveway as you first approach has an inlet which holds fish as does the corner diagonally opposite. Good luck and post some pics!! Fished Dever again yesterday. Clarity was excellent on bottom lake, good on top lake by the entrance. Slow start but after 2 hours 1st fish on damsel nymph. Caught 2 mid pm on red stick fly. Then mayfly started hatching and fish were rising profusely on top lake. Switched to a mayfly imitation and caught my 4th. 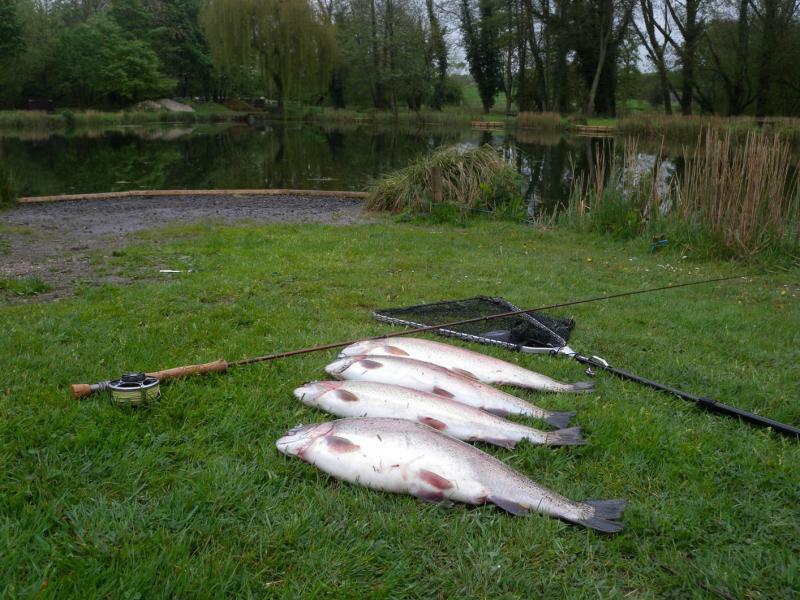 All fish were in superb condition weighing between 4lb 12 and 7lb 2oz. Love Dever!